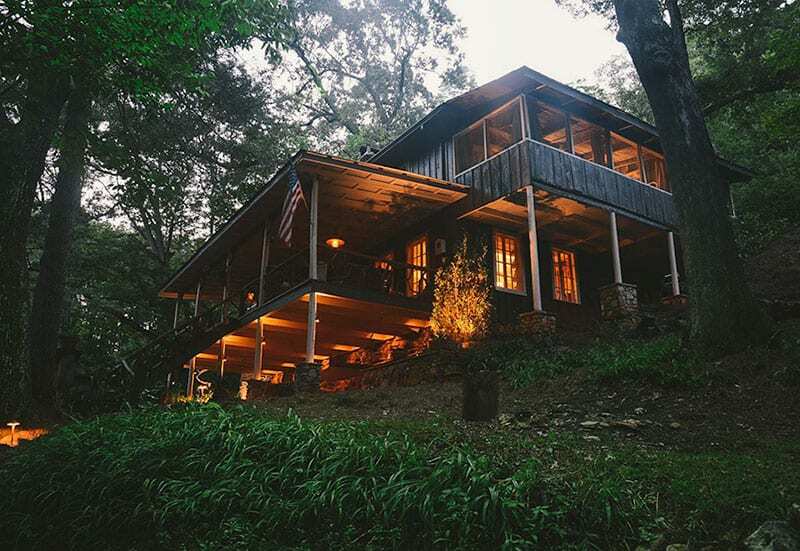 Not long ago, we wrote an article on the 24 Best Airbnb Cabins in North Georgia. We were just messing around reviewing some of the spots we had stayed at in the past. But turns out there was a lot of interest in our recommendations. Fast forward a year or two later and Airbnb has grown like crazy. With all the new listings that have shown up since the last time we posted, we thought we’d create a new list of some of the best and latest spots we’ve found, stayed at, or are day dreaming about in and around Clayton Georgia. That means that every cabin listed here will get you to downtown in 20 minutes or less – and in a few cases, just a short walk! So take a look below and let us know what you think. We’ve tried to offer a good variety of cabins based on location, budget, and personality. If you don’t find anything that fits on this list, you won’t hurt our feelings. But if you do, please consider sharing this article on Facebook or with your friends. This isn’t a sponsored post (we don’t do that) so no hidden agenda here other than we like these and think you might too. Enjoy! We’re also working on a Best Of list for all the major North Georgia cities so be sure to drop a comment or link of your favorite one in the comments below! 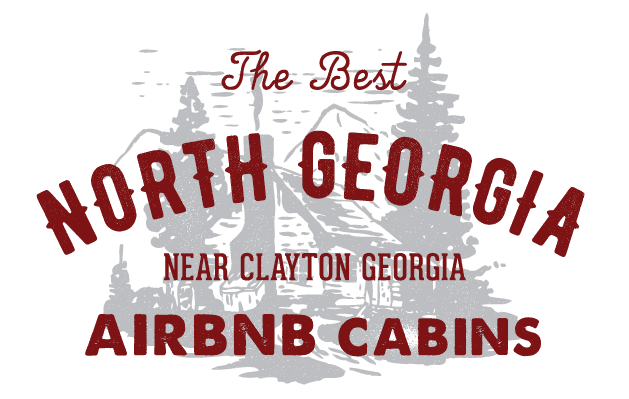 And if you decide to book one of these spots, be sure to tell them that you decided to book because you saw their spot on Wander North Georgia! *We set the booking dates for a week in March and the prices were generated off of that time frame. Keep in mind the pricing may be slightly different depending on what time of the year or season you plan your trip. If you decide to book one of these amazing homes, please be sure to use THIS LINK for up to a $40 instant credit on your booking. 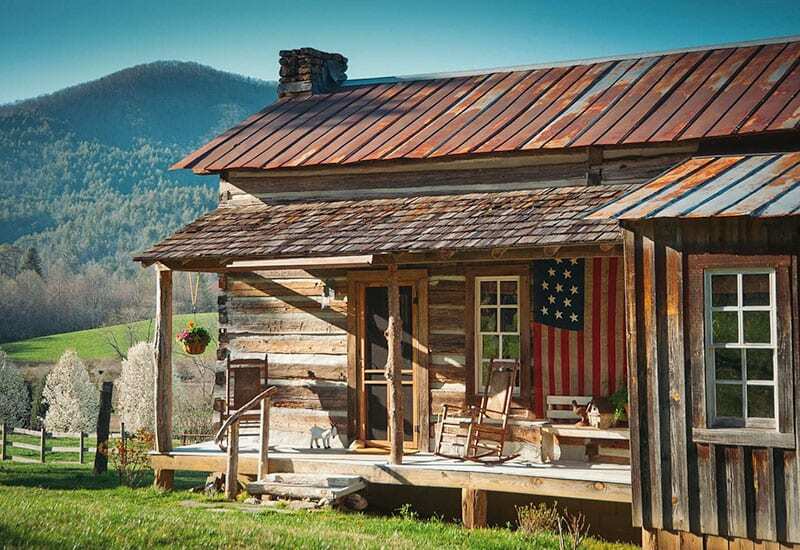 More Info: Come experience an authentic 1880’s log cabin in the North Georgia mountains! Our cabin is located on our small sheep farm “Wolffork Valley Farm”. Come feel at home and rest, while taking in the spectacular view! 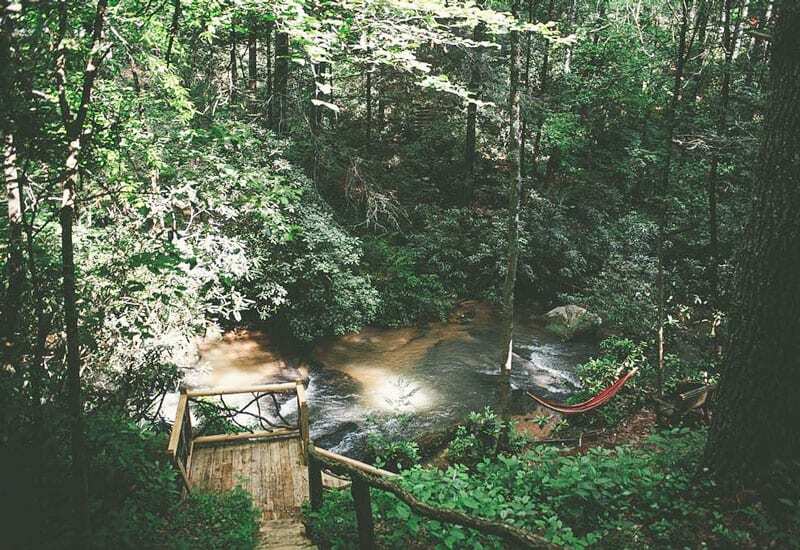 Explore North GA, hike, visit wineries, shop, take in some music, travel down river, or fly through the trees on a zip line. Or, get a little glimpse into “farm life”, from farmer Bill. 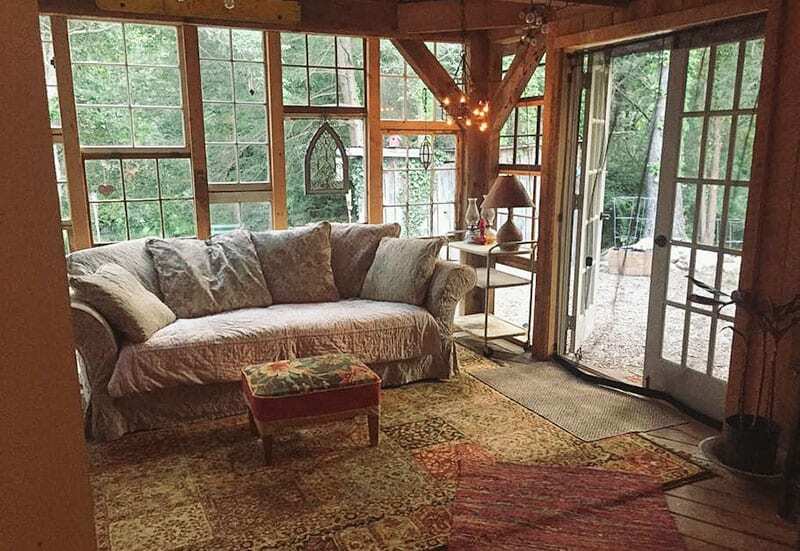 More Info: Nestled in Rabun County, GA this once old woodshed has been transferred to a small tiny gem. The tiny house includes a double bed, 50” flat screen TV, small fridge, microwave, full tiny bathroom with shower and loft reading nook. Outside you will find 8 acres to roam, two person hot tub, grill, fire-pit, private trails, and small waterfall with a private porch. The Lil Red Tiny House is located about 40 feet behind our farmhouse we live in. More Info: Charming cottage with lake access dock, mountain views, and hot tub. This 1BD/1 BA perfect getaway includes a vast deck with an outdoor spa that overlooks southwestern mountain vistas. 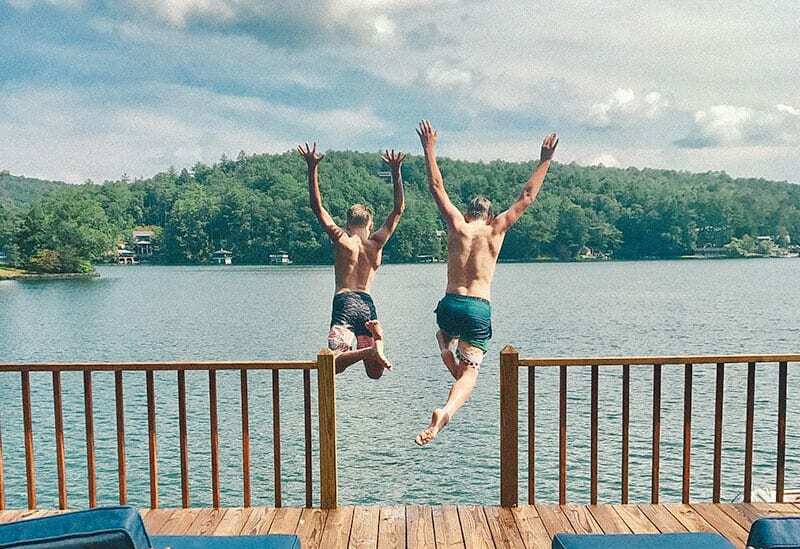 Just a short walk away to community dock for swimming, boating, and fun on Lake Burton. Close to LaPrades Marina/restaurant and Anchorage Marina. Explore nearby NE Georgia whitewater, hiking trails, and charming mountain town squares. More Info: Wiley Mountain Lodge is a century old Inn that welcomed north Georgia’s 1st visitors off the Tallulah Falls Locomotive Trains at Wiley Station. Horse and buggy brought guests to the front steps of, what was then, Mountain Laurel Inn. Guests were greeted by the Inn’s owner, Mrs Blanche Court, and the luggage boy took the leather suitcases up the winding stone steps to the broad front porch. 100 years later we have transformed Wiley into a great place for couples, families and guests. 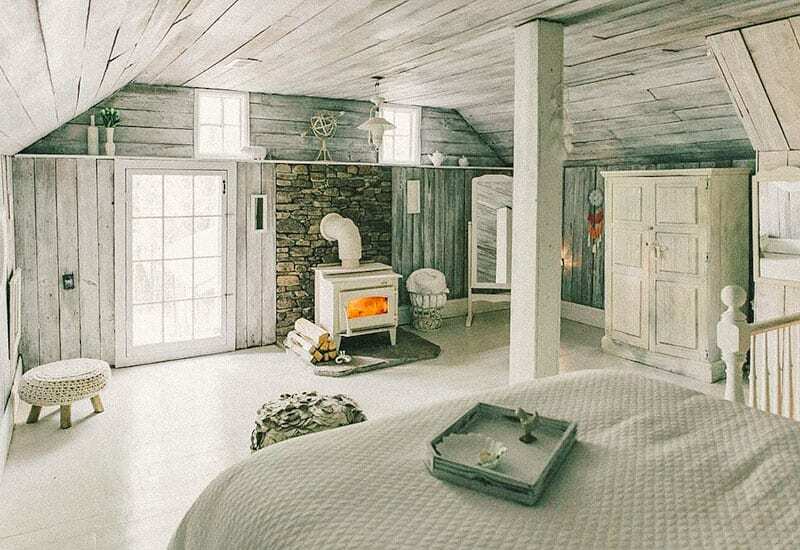 More Info: Originally built in the 18th century and lovingly rebuilt in the 1960s, this tiny cabin is a charming getaway. Just a few miles from the Appalachian Trail and 15 miles from Helen, GA, our cabin is convenient yet secluded. At 500 sq ft total, it is snug. Please note, in keeping with the time, ceilings on the first floor are as low as 75” in places. Particularly tall guests will want to keep this in mind. Luckily, ceilings are a bit taller upstairs and there are plenty of cozy places to lounge! 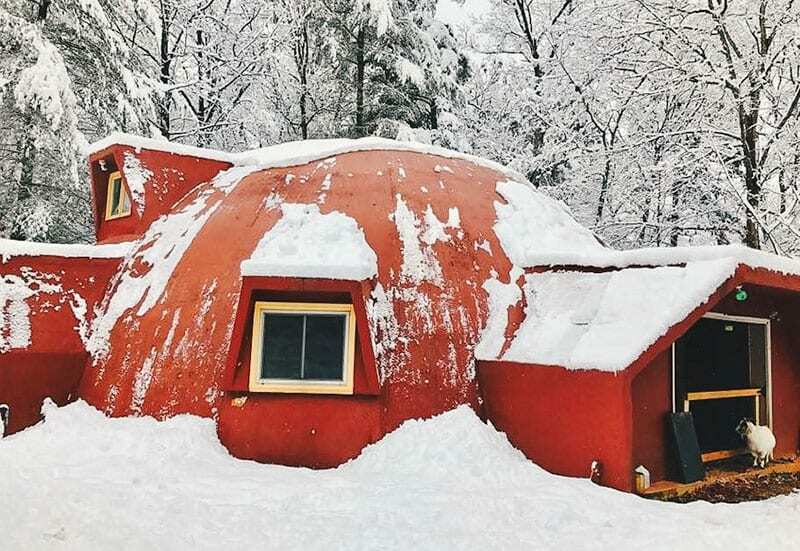 More Info: The Dome Home is a fun and funky new experience for sure! With a zen hostel vibe, and guests from all over, you never know what you’re gonna get! Some evenings may be quiet, and others might have events going on, or other guests. We are kid friendly and also pet friendly as the location doubles as a farm! More Info: Plan the perfect mountain getaway! An amazing and well appointed three story home with unique touches throughout. Ideal for a couples getaway or a family retreat. Relax on one of the three decks. Explore the lush pebble trails that weave across the 2.5 acre property. Bring your rackets for the private tennis court. The house has recently been made over with designer touches and there’s plenty of rooms designed for comfort and conversation throughout the house. Easy access, paved roads. 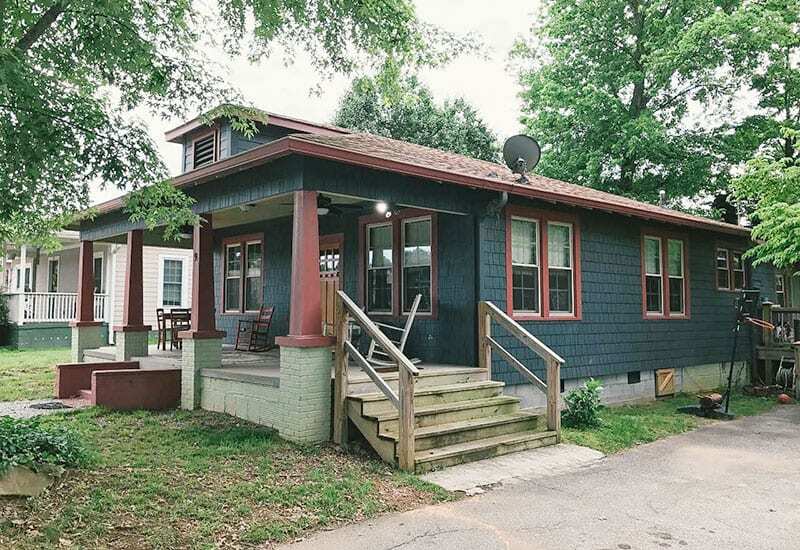 More Info: This craftsman style house is walking distance (50 yds) to 8 restaurants and bars in beautiful downtown Clayton and is in the shadow of Black Rock Mountain State Park. Lake Burton, Lake Rabun and Lake Seed are within a 10 mile drive. The Wild & Scenic Chattooga River is also less than 10 minutes away and Tallulah Gorge is only 15 minutes away. More Info: A scenic drive will have you in one of Georgia’s best kept secrets: Clayton, Georgia. Nestled among mountains and lakes, this small town dates back to the early 1800s. Clayton, Georgia is a beautiful place to hike, kayak, swim, eat, shop,and play. Downtown is a charming row of antique shops, clothing boutiques, and a flourishing restaurant scene. More Info: Cade’s place is a 100 + year old “Guest cottage” at Shady Oaks Farm. In earlier years it served us as a barn, storage, and playhouse. 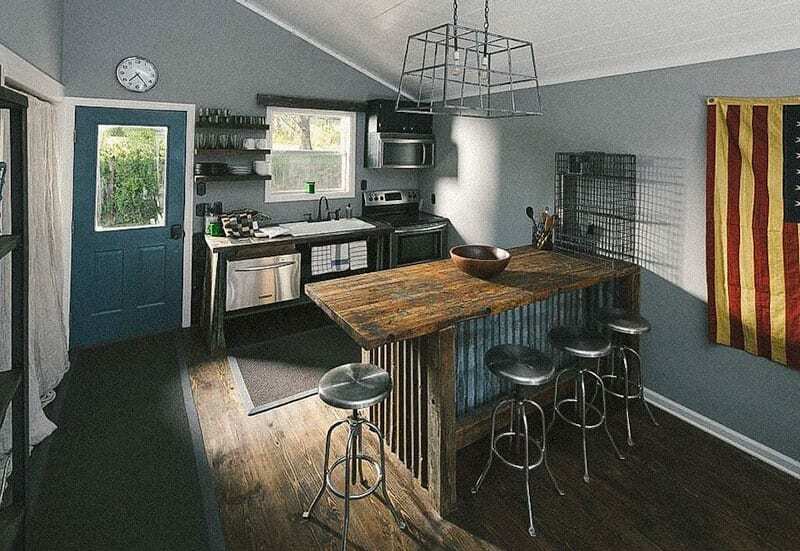 It has recently been restored, keeping a rustic theme with the modern creature comforts of today including coffee, USB ports, WiFi, heat , air, a large patio with a tin roof, gas grill and a super cozy and romantic gas fireplace. An outdoor shower with hot water is just outside the cottage. More Info: Enjoy the warm glow of the fireplace while sipping on a whisky as clear mountain water rushes by in the creek below. Seemingly float amongst the trees as you relax on the screened in porch filled with sunlight and a calming breeze. Show the kids how to roast the perfect marshmallow or prepare an amazing dinner in the slate stone fire pit. Sit around the dining table, chatting, playing classic games with a record playing in the background. Bathe your senses with the perfect mountain getaway. 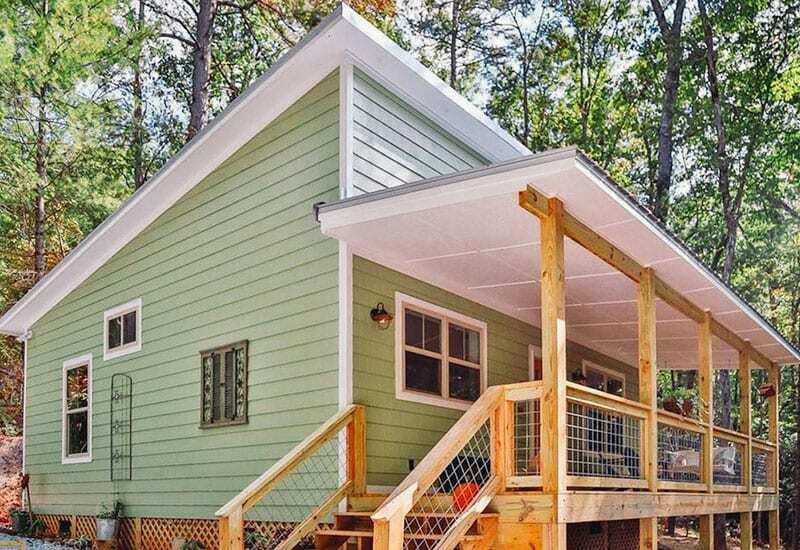 More Info: This newly constructed, quaint cabin is nestled in the Blue Ridge Mountains of Tiger, Rabun County, Georgia, and offers a two-season mountain view. HGTV-inspired decor, shiplap walls, and the bright, open living space makes the cabin a welcoming escape for a weekend getaway or full-length vacation. 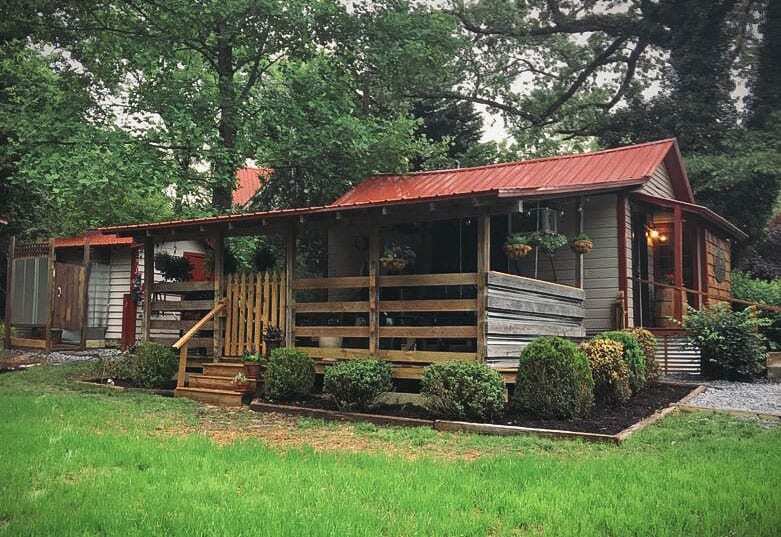 Great location near two vineyards, a drive-in movie theater, local farms, and multiple waterfall hikes, parks, and just two miles from Lake Burton (on-site parking available for an RV and/or a boat). More Info: This is a quintessential Rabun-style cabin nestled among the towering mountain pines, in one of the lake’s larger coves. 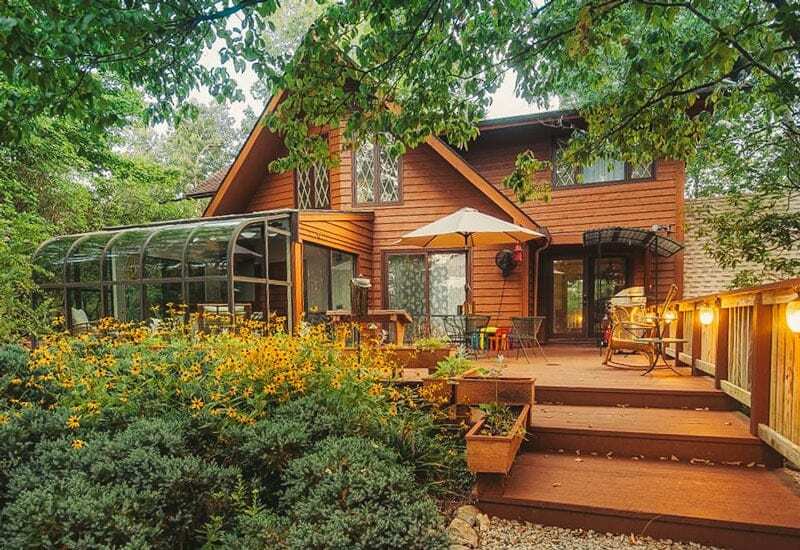 Built in 1935, from land purchased from lake founder, August Andrea, this home has been lovingly restored and ready to enjoy. Conveniently located right on prime shoreline, less than a mile from the historic Lake Rabun Hotel & Restaurant, Louie’s, and Hall’s Boat House. 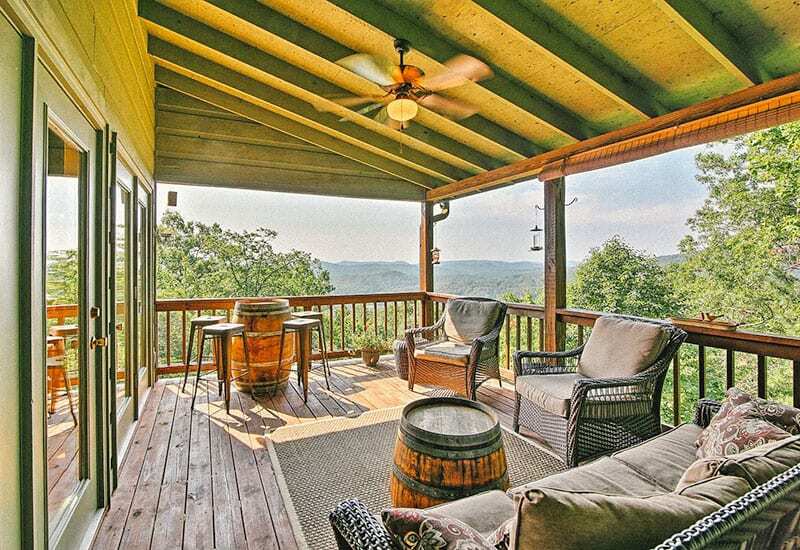 More Info: From the second you lay eyes on the view from ‘Black Bear Ridge,’ you’ll never want to leave! 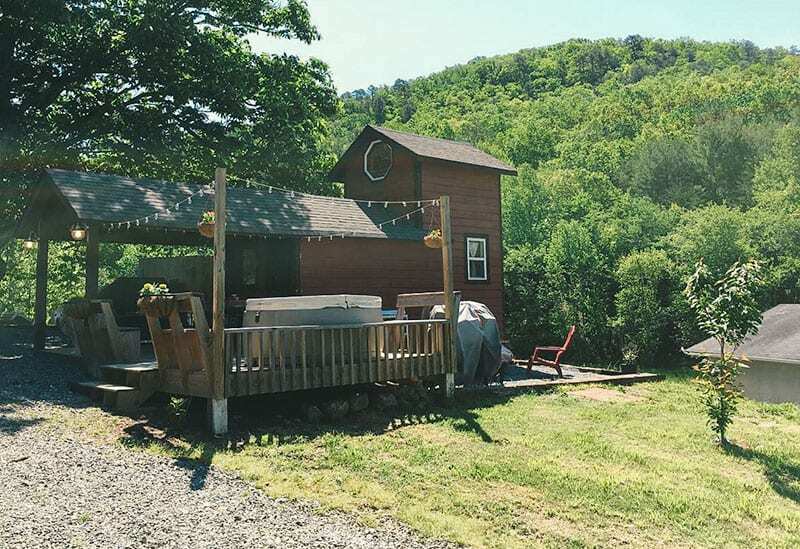 This vacation rental cabin sits on 3.65 acres and has 4 bedrooms, 3 bathrooms, and room to sleep 10. 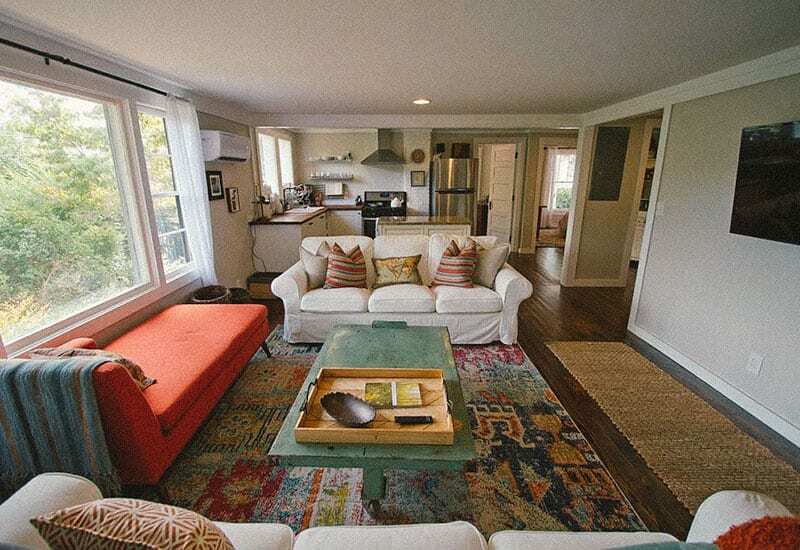 With 3 floors, 2,889 square feet, and 2 spacious decks, there’s room for everyone! You’ll be just 4 minutes from downtown Clayton and have easy access to tubing/whitewater rafting excursions nearby. 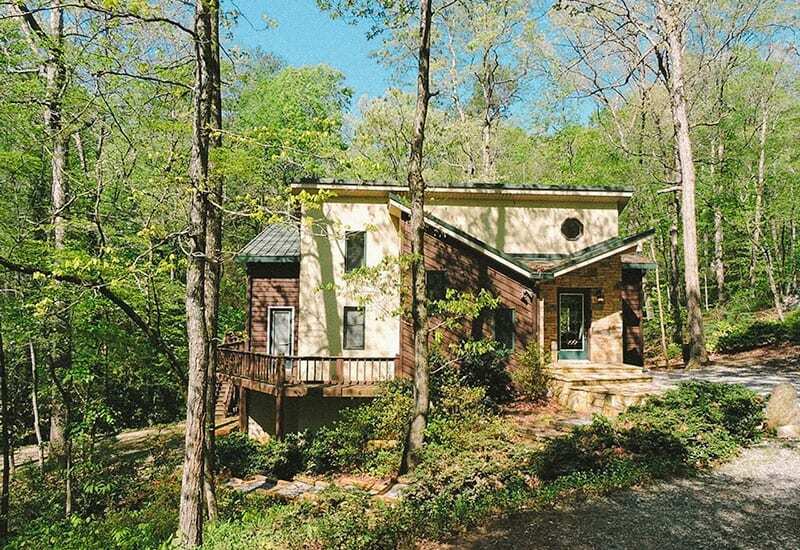 Wineries, Lake Burton, and trails at Tallulah Gorge are all within a 20-minute drive of this incredible home! More Info: The best of both worlds . . . less than a mile to historic Main Street, with the feeling of your private little slice of cabin living in the woods. Stylish and comfy decor with owner’s art throughout. Wake to the sound of pileated woodpeckers. Read a book while warm sunlight filters in the rear room of windows. Hike the nearby Bartram trail. Raft the Chattooga. Enjoy award-winning food and drinks in town. Or cook and sit around the campfire reminiscing over the awesome day you had in the mountains. 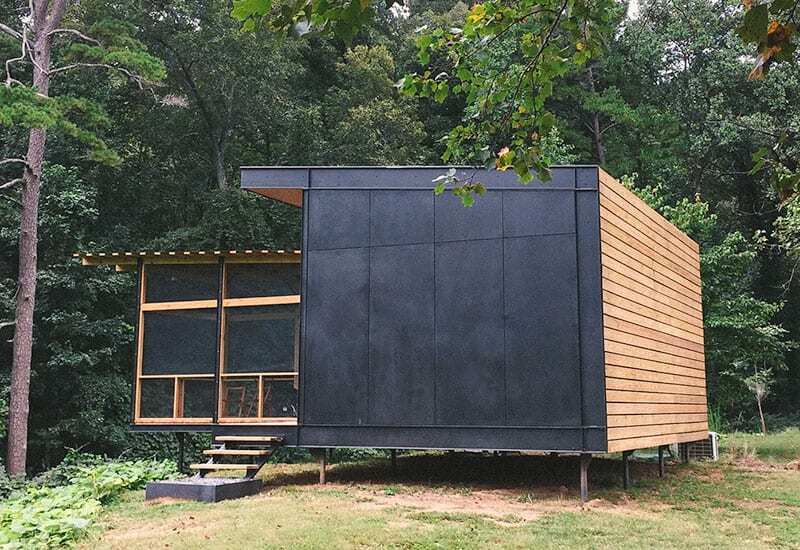 More Info: The Cabin is the first free-standing lodging space at the Mill. This very private space overlooking a beautiful meadow is secluded and cozy. Enjoy the unique renovated spaces at the historic Habersham Mills. Located along the Soque River shoals, only 70 mins from Atlanta and Athens. You can read more about the other properties at Habersham Mills here. More Info: Unique home on 6 acres with spectacular views throughout the home overlooking the river and 150′ waterfall. Views can be seen from the living room, den, kitchen, master bedroom, master bath jacuzzi, hot tub and lower deck. This property is about 15 miles from the city of Helen. 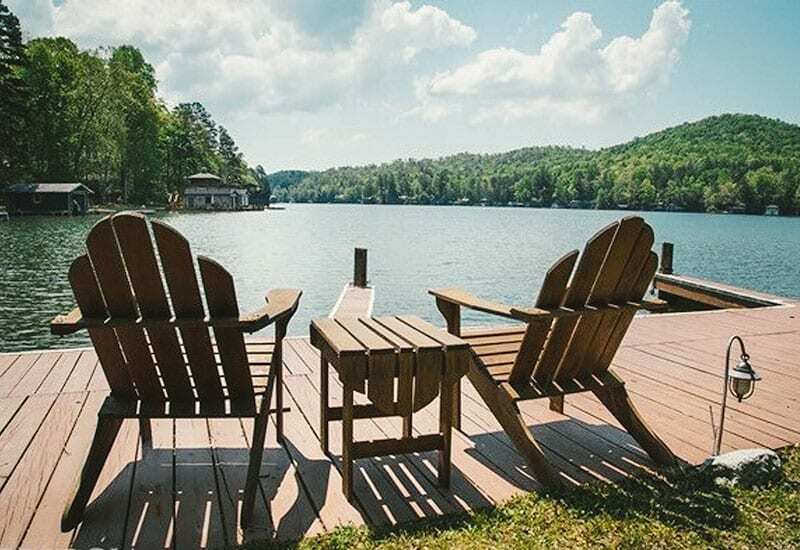 More Info: Perfect getaway located on lake Chatuge in Hiawassee, GA. You have access to dock for fishing and swimming or bring your own boat. Decor is cool vintage industrial. Bed is a comfy king. Den has a cool vintage futon and two fold up cots that double as wall decor. Kitchen is stocked with all the essentials. There is a charcoal grill on the back porch. By the lake, gather around the fire pit to roast marshmallows and watch the stars at night. Remember, if you decide to book one of these amazing homes, please be sure to use THIS LINK for up to a $25 instant credit on your booking.